Yesterday I told you that I was lamenting about the gray fabric for Lucy’s quilt…well this is what I ended up with….. plain light grays. See the rectangle that’s plain? Well I want Lucy’s name to go there….so I hand drew out some letters. Here they are. The first “L” was too big. This is the second version. I’ve not really done this kind of applique much so I’m a newbie. I decided to use Lori Holt’s method using sew in interfacing. I didn’t know what way to turn the letter when I traced it on so I tried reversing it…. I followed the steps by tracing the letter onto the interfacing….. I turned it right side out… Darn it….see what happened…. I shouldn’t have reversed the letter when I traced it. So I redid it….Newbie mistake for sure. Then my next challenge was the “L”. I couldn’t do it the same as the letter wouldn’t turn right side out if I sewed the inside of the letter too…so, I just sewed the outside. Then I make an incision through both layers and clipped. Here’s how it looked from the topside…..
…and here’s how it looked from the bottom side. I pressed it in place. Then I used a little bit of glue to keep it in place. Here’s how it looked all together. While I had been making the quilt I had been thinking how our son Buck always calls Lucy his “little mouse”. Well that got me thinking that if there was enough room on the quilt top after I got Lucy’s name done, I might add a cute little mouse on the side…and there was…. So I sent to computer and googled “mouse black and white clip art”. This cute guy came up. I copy/pasted it into a Word document and sized it what I needed. Then took it upstairs to see how it would look….I like it. The mouse makes it Lucy’s quilt…. I’m feeling pretty good about this so far as I’m a real newbie when it comes to applique like this. But..I’m so proud of myself. I had wanted to expand my horizons and try new techniques this year. I know this isn’t a lot but, it’s progress. I did have a little help from these two products. Sew in interfacing and Clover’s Press Perfect tool. That little tool is great for getting the applique pieces right. I highly recommend it. 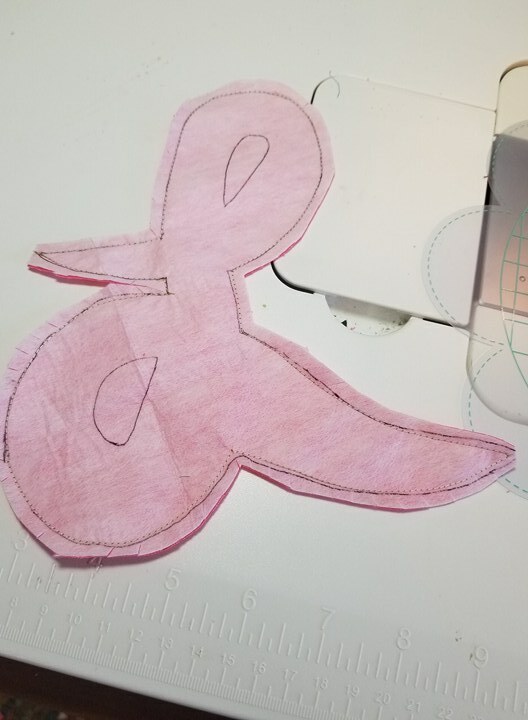 I talked to Kayla as I was trying to figure out what method I wanted to use for attaching the applique….hand or machine. I wasn’t too excited for this part. She suggested machine as then the stitches might be more sturdy as it’s meant to be washed and used often. I agreed…they we went on to debate using a blanket stitch or a blind hem. Again, we think blanket stitch as we think it will be more sturdy. Stop back again to see how that all goes. I’m right on top of this project as I’ll be seeing Lucy this weekend for her baptism and I want this finished!! See you back here next week. I have a sewing day with Connie scheduled for Saturday so I’m hoping for some progress on my string challenge then…that is if this quilt if finished. Go, Jo, GO!!! This entry was posted in String Challenge, Uncategorized, What I'm Working On on March 19, 2018 by Jo. I’ve seen this appliqué technique with iron on interfacing. You have to be very careful setting the edges once the piece is turned, but then it’s an iron on patch. It’s a lovely quilt, Jo, and I’m sure Lucy will love it. What a lovely quilt! The mouse is perfect! Love the addition of the cute little mouse. What a wonderful gift! Off to the basement, snow day again due to ice. The long arm is calling me. Your quilt is adorable. 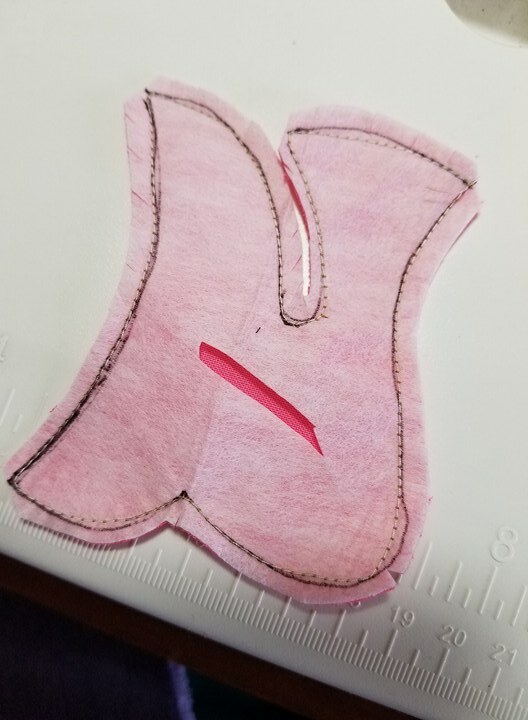 Like you, I am a newbie at applique but have used this same method and loved the results. I make the applique and only iron it onto my quilt. then when the quilt is finished, I topstitch closely around the edge of the letters/applique, which not only anchors the applique, but also quilts that area also. Good luck however you do it. I know it will be beautiful like all your quilts are. Wonderful little quilt! See, you can do small too! Lucy’s quilt is great and that little mouse is just a perfect touch. What a perfect quit for Lucy and the mouse makes it special for her and for Buck. I’m busy working on a pink & grey twister quilt for new baby. Enjoy the weekend with family and the baptism. I think you accomplished a lot with learning something new. Great Job!! It is a beautiful quilt and they all will love it. It is so special! Do you wash and dry all the fabrics before you do the applique? I usually wash the quilt( fabrics, batting, etc) only after it is all finished because I like ‘crumpled’ textured, antique-y look. But I’ve never tried an applique quilt. Should I launder everything beforehand so the applique isn’t distorted? I haven’t but I’m a newbie. I’ve used this method, as well as free cutting letters for raw-edge applique, too. I’m interested to see how you finish this off. Good luck!! Beautiful. Looks like the sew-in interfacing might give it a bit of a raised effect. Great job, Jo! I love the mouse. quilt,speciala for you and Buck and Lucy.